The life-story and legends of St. David are largely based on his biography written by one Rhygyfarch in the late 11th century. He is generally accepted as having been the son of a lady of noble Irish birth living in Dyfed. Lady Non by name, she had taken on a religious life, joining the convent at Ty Gwyn near Whitesands Bay. However, her beauty brought her to the attention of Sandde, a prince of the adjoining Kingdom of Ceredigion, while he was travelling nearby. His advances were, of course, vehemently rejected but the Royal lord would not take no for an answer and forced his passions upon the unfortunate Non. The poor girl fell pregnant with the future St. David: a man of such holiness that even from the womb he, apparently, performed miracles. For an old story tells how, during her pregnancy, Non entered a certain church to listen the preaching of the local priest – he is said to have been St. Gildas but he was somewhat younger than David – and immediately the man was struck dumb. Because her child was soon to excel all religious teachers, the cleric found himself unable to continue whilst in the great man’s presence. He was eventually born in the middle of a violent storm at Caerfai, on the coast just south of Mynyw (St. Davids), where a ruined chapel still marks the very spot. Traditionally, this was around AD 462, though recent work by Carney suggests AD 487 to be a more likely date. Non named her son, Dewidd, but he was commonly called Dewi from the local Dyfed pronunciation. David is an English version taken from the Latin, Davidus. He was brought up, by his mother, in Henfeynyw (Vetus Rubus) near Aberaeron and, at a young age, was baptised by his maternal cousin, St. Eilfyw. David may have been educated by St. Colman of Dromore, but this seems unlikely. David was greatly attracted to the Welsh Church and, when he became a man, he was soon ordained a priest. He travelled to the island of Wincdi-Lantquendi (possibly Whitland) in order to study under St. Paulinus of Wales. He stayed there for at least ten years, but is also said to have studied under St. Illtud at Llanilltud Fawr (Llantwit Major) around this time. David was a star pupil and even cured Paulinus of his blindness. Our saint then began to travel the country, evangelising as he went. He is said to have founded twelve monasteries in Southern Wales, though many of these are erroneous later claimants. PC Bartrum suggests that possible genuine foundations may have included Glasgwm (Elfael), Colfa (Elfael), Llangyfelach (Gwyr), Llanarthne (Ystrad Tywi) and Betws (Ystrad Tywi). He also visited the court of King Proprius of Ergyng – probably King Peibio Clafrog – and cured his blindness too. Eventually, David returned to Henfeynyw where he met up with his relation, Bishop Gwestlan. The two were neighbours and companions for some time, before the Welsh patron moved on to nearby Rhoson Uchaf (Rosina Vallis) near Mynyw (St. Davids). He was accompanied by a number of disciples, including Aeddan, Teilo and Ysfael, and together they founded the monastery of Mynyw (St. Davids). An Irish chieftain, named Bwya, living at nearby Castell Penlan, was not best pleased at this invasion of monks and plotted to drive them out. His wife sent her maidservants to bathe naked in the River Alun and tempt David and his followers, but the clerics were far from impressed. Misfortune soon befell the Irish couple and David was able to settle down without further harassment. By this time, David’s fame as a spiritual leader was becoming widespread throughout Britain. He became known as ‘the Waterman’ – David Aquaticus (Dewi Dyfyrwr) – because he encouraged his followers to live drink and bathe in cold water. He attracted pupils from many walks of life, including retired monarchs like St. Constantine of Dumnonia. From Mynyw (St. Davids), they spread the Word of God, travelling across the country and especially to Ireland. St. Aeddan crossed the Irish Sea and founded the monastery of Ferns from where a premonition warned him that David was about to be poisoned. He sent his companion, Ysgolan, to save the great saint from assassination; which he did. Other Irish visitors included Bishop Barre to whom David lent a miraculous horse which carried him home across the sea! David then decided to undertake a pilgrimage to Jerusalem with SS. Teilo and Padarn. It is said that they were there consecrated bishops by the Patriarch. Upon his return to Wales, in AD 545, David was persuaded by SS. 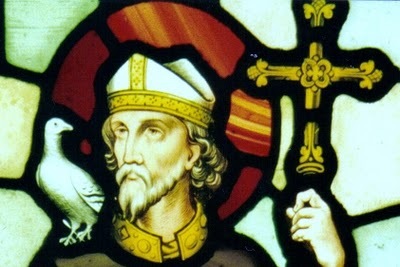 Deiniol, Bishop of Bangor Fawr, and Dyfrig, Bishop of Ergyng (and said to be Archbishop of Wales) to attend the Synod of Llandewi Brefi, which had been convened to discuss disipline within the church and to stamp out the Pelagian Heresy. St. Paulinus of Wales had recommended his old pupil, since his six-foot stature made him ideal for addressing the vast crowds. The story goes that David spoke so eloquently before his peers that a hill miraculously raised up beneath him. Dyfrig resigned his Archiepiscopate in David’s favour; and he moved the cathedral from Caerleon to his own foundation at Mynyw (St. Davids). The elderly St. Gildas is said to have disputed the appointed, but SS. Cadog and Finnian of Clonard ruled in favour of David. In fact, it is unlikely that an archiepiscopal see existed in Wales at this time, but David’s monastery does seem to have eclipsed the influence of the more easterly church. A second synod, of Victoria, was summoned some years later, in AD 569, to re-assert the anti-pelagian decrees agreed at Brefi. It was possibly around this period that David is said to have visited Glastonbury in Somerset. He had learnt of the abbey’s great sanctity and wished to dedicate the building. However, upon his arrival, he apparently had a dream in which the Lord appeared to him and declared that he had already dedicated the church in honour of his mother, St. Mary. So, David decided instead to extend the so-called ‘Old Church’ erected by St. Joseph of Arimathea and constructed a more extensive building to the east. David died at Mynyw (St. Davids) on Tuesday 1st March AD 589 and was buried in his cathedral, where his relics are still venerated to this day. He must have been extremely old.